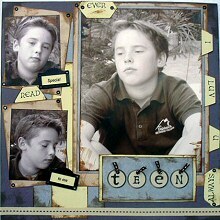 Using layering techniques and inking the edges of your page elements are an effective way to create a collage layout. In this article Chris shows you just how easy it is too! This layout was created using Light Green Bazzil cardstock, Patterned papers (Gin-X Flyby � Purple Merlin, Forgot My Birthday � Prom Queen Purple, His Christmas Wish � Meatloaf Double-Beatloaf), Tim Holtz Distress Inks Vintage Photo, The Card Connection Collage Keepsakes I.D Plates, Black eyelets, Patterned gros grain ribbon, Pixie Alphabet Stamps Celtic, Xyron 150 and Karen Foster Alphabet Tags stickers. Use the Flyby � Purple Merlin paper as the back ground and ink the edges. Cut a strip approximately 10.5" x 4" from the Forgot My Birthday � Prom Queen Purple, ink the edges and adhere to background. Cut a strip from the Bazzill approximately 8.5" x 2", ink the edges and adhere to the Forgot My Birthday- Prom Queen Purple overlapping on the bottom. Ink the edges of your photos. Matt the large photo onto the Forgot My Birthday � Prom Queen Purple, ink the edges. Mat again on the His Christmas Wish � Meatloaf Double-Beatloaf and ink the edges. Cut out tabs (I have made my own), ink the edges, stamp with desired words and place as shown in the layout. Set eyelets in the 2 bigger tabs. Matt the smaller photos onto the His Christmas Wish � Meatloaf Double-Beatloaf, ink the edges and angle the photos as desired. Set eyelets in the corners of all except the bottom right where you will place an ID plate with words as desired. Place the other ID plate on the top photo as desired. Cut a matt approximately 5" x 2.5" from the Bazzill and ink the edges. Cut a smaller matt from the Forgot My Birthday � Prom Queen Purple, ink the edges and adhere the word TEEN using the Karen Foster Alphabet Tags stickers. Set eyelets and attach ribbon. Place accent on the bottom of page. Create a small tag from the Bazzill. Ink the edges and use a letter of your choice from the Karen Foster Alphabet Tags stickers to highlight a word (I have used the letter W). Set an eyelet through the hole and journal as desired. Stamp the word 'Read' on top of tag and place tag behind the bottom photo matt. Run a length of the patterned gros grain ribbon through the Xyron 150 and adhere to the bottom of your page.